Federation intern, Mariko Polk, recently won first place in the student category of the Battle of the GeoMaps at the North Carolina ArcGIS User Group 2015 Conference. The Battle of the GeoMaps is a mapping poster competition that recognizes achievement in solving problems faced by the user community or public at large. Judged by peers in attendance at the conference, Mariko edged out other competitors to win the top student award at the event. Mariko’s poster presented a study she conducted with Dr. Devon Eulie of the Department of Environmental Studies at the University of North Carolina Wilmington, addressing the effectiveness of living shoreline projects in improving coastal resiliency. 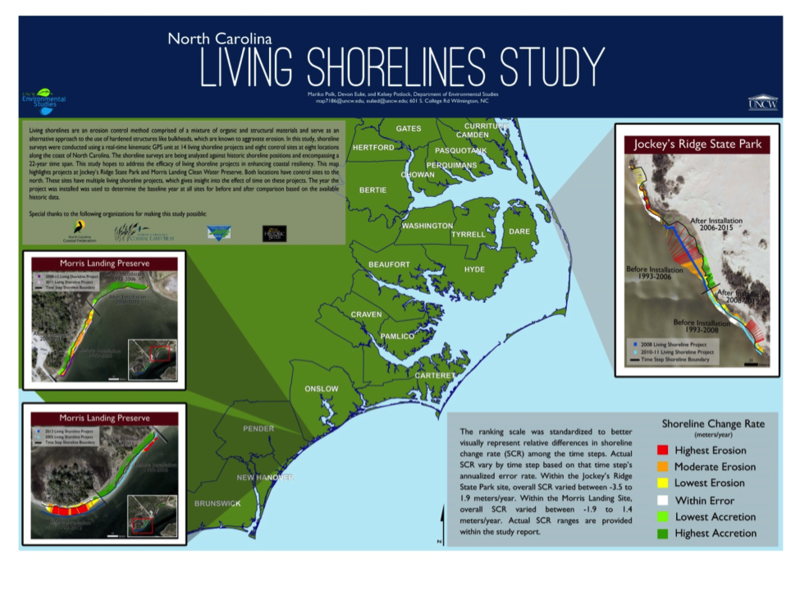 The study compares 14 living shoreline projects and eight controlled site locations along the North Carolina coast. Many of the living shoreline projects the study looked at were installed by the federation. The shoreline surveys are being analyzed against historic shoreline positions over a 22-year time span. 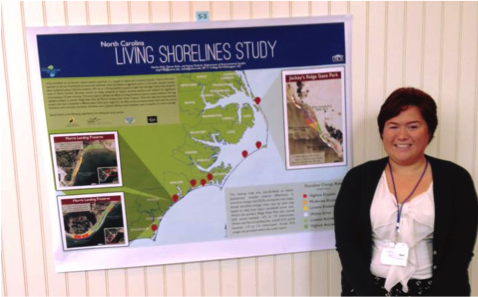 Mariko, one of the federation’s 2014 Coastal Advocacy Institute’s summer interns, came to the N.C. coast after receiving her BS in Environmental Resource Management from California State University Bakersfield and a Certificate in Geographic Information Science from the University of West Florida. Currently a graduate student in environmental studies at the University of North Carolina Wilmington, Mariko has continued her involvement with the federation working with local municipalities on stormwater runoff issues. The map above highlights projects at Jockey’s Ridge State Park and Morris Landing Clean Water Preserve that are part of Mariko’s winning study. For now, Mariko is working on wrapping up her data analysis and is on track to graduate in December. Ultimately, however, she’d like to apply some of the same skills she has nurtured with the federation and that won her recognition from her peers at the North Carolina ArcGIS User Group: demonstrating the importance of maintaining a natural coast and ensuring water quality through preventive measures.